The Amazon sale is ending today, along with your chance to bag big discounts on a range of Amazon's finest devices. We've seen the best prices of 2019 on the likes of the waterproof Kindle Paperwhite, Fire TV Sticks and multiple Amazon Echo smart speakers. We aren't expecting to see any better deals than this anytime soon, either. You certainly shouldn't worry about Amazon suddenly dropping an even better Easter Sale this weekend, for example, as Amazon's Easter Weekend deals last year were nothing worth remembering - so this is it! 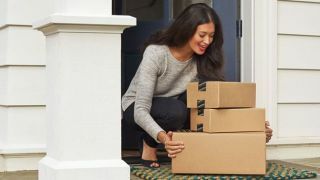 You might be waiting for Amazon Prime Day 2019 if you want to see some of these cheap deals again. This is the best price Amazon's most popular smart speaker has been this year. Actually, after a massively successful Christmas sales season, it was sold out until late March, making today's £20 discount even better. This is likely to be the best price you'll see before the Amazon Prime Day deals event in the summer. > In the US? Get it for $10 off at $39.99. Amazon revamped the already excellent Paperwhite towards the end of last year by waterproofing the design and making the backlit screen flush with the bezel, meaning you no longer have to worry about dust or strands of hair getting caught at the edge of the screen. All this without increasing the price! Previously if you wanted a waterproof Kindle you'd have to shell out for the top-end Kindle Oasis for £229. We'll take this one for £99 instead thanks! Those are our favourite three deals in the Amazon sale today, but there are lots of other discounts available too. If you're after a cheap smart speaker with a screen you might be tempted by the Amazon Echo Spot for £94.99 (save £25). If you want a bigger sound than the Echo Dot offers, the larger version is on sale too. Get the Amazon Echo for £64.99 (save £25). If you already have a great speaker setup at home but would like to make them 'smart' by adding Alexa features, you want to grab an Echo Input for £19.99 (save £15). Need a cheap tablet? iPad 'deals' making you sad? Then how about this for a sweet deal? Get the Amazon Fire HD 8 for just £59.99 (save £20). That's a great deal for a reliable slate. That's only £10 more than the 7-inch version, but we're not massive fans of that one as it doesn't come with an HD screen. The non-4K Fire Stick Stick is just £24.99 (save £15), making it a super cheap way to add smart features to your TV or add apps that your older smart TV might be missing - we find some older models don't come with Amazon Prime video installed for example. To be honest though, we think it's worth spending the extra tenner on the version we highlighted earlier instead. It's also discounted in the US at just $29.99 (save $10).